In a survey of different airlines, groups travelling with Ryanair were more likely to be seated separately if they hadn’t paid for their seats. A Ryanair plane at Frankfurt Airport. THE UK’S AIR travel watchdog is to investigate airline seating arrangements amid “confusion” about their rights about allocated seating. 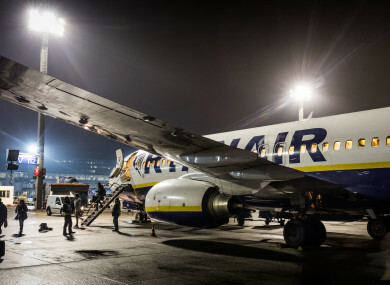 The UK Civil Aviation Authority (CAA) has also published research which showed that groups travelling with Ryanair were more likely to be seated separately if they hadn’t paid for their seats. The CAA said it will seek information from airlines “about their allocated seating practices to find out whether consumers are being treated fairly”. “Some random seat passengers are confused by the appearance of empty seats beside them when they check-in up to four days prior to departure. The reason they can’t have these window or aisle seats is that these are more likely to be selected by reserved seat passengers many of whom only check-in 24 hours prior to departure,” Ryanair said in statement last year. In the CAA’s research, polling company YouGov asked passengers of 11 different airlines about their experiences and found that passengers travelling with Ryanair were the most likely to be seated separately if they hadn’t paid for seats. The research found that although most passengers were aware they needed to pay for allocated seats to ensure they sat together, two in five respondents thought they would be automatically sat together regardless. Around half of all passengers who sat together did not have to pay an additional charge to do so and the CAA has therefore said that seat allocation must be done “in a fair, transparent way”. “As part of the review, we will be asking airlines to provide information on their policies and practices,” said CAA chief executive Andrew Haines. We will be looking into how airlines decide where to seat passengers that have booked as part of a group and whether any airlines are pro-actively splitting up groups of passengers when, in fact, they could be sat together. Email “The UK's travel watchdog is to investigate if airlines are 'pro-actively splitting up groups'”. Feedback on “The UK's travel watchdog is to investigate if airlines are 'pro-actively splitting up groups'”.